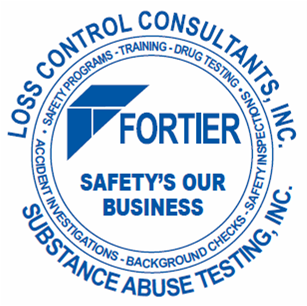 Fortier Loss Control Consultants, Inc.
Fortier Loss Control Consultants is a veteran-owned, professional safety consulting firm established in 1984 by Lee Fortier. Over the last thirty-two years, we have grown to become a company recognized and respected by our numerous clients both local and national. We currently have eight full-time consultants. Seven of our eight consultants have been with Fortier for over fourteen years. All of our consultants are OSHA Authorized Construction Trainers through the U.S. Department of Labor and are Medic 1st Aid Instructors through the Health & Safety Institute. All of our consultants are more than qualified to provide informative and accurate knowledge regarding safety issues. Lee established Fortier Loss Control Consultants in 1984 to assist companies with their safety needs. He opened Fortier Substance Abuse Testing in 1994 when he recognized a need for quality substance abuse program management. Prior to establishing these businesses, Lee worked in the insurance industry providing safety services to clients. Lee became a Certified Safety Professional (CSP) in 1984. He holds a Bachelor of Science degree from Tennessee Technological University. Throughout the years, Lee has held various positions in numerous professional associations such as the American Society of Safety Engineers, Tennessee Road Builders Association, Associated Builders & Contractors, and the Tennessee Safety Congress. Lee is a retired Colonel in the U.S. Army Reserve. In 2013, Lee and Brian Dolin established D & L Safety which provides full-time onsite safety personnel. Brian manages the Knoxville Fortier branch office. He has been with Fortier since 1999. Prior to Fortier, he operated as the Safety Manager for Phillips & Jordan and prior to that he served in the United States Army and the Louisiana National Guard. Brian became a Certified Safety Professional (CSP) in 2004. He holds a Bachelor of Science Degree from the University of Southwestern Louisiana and a Master of Science in Safety Management from the University of Tennessee. In 2013, Brian and Lee Fortier established D & L Safety which provides full-time onsite safety personnel. Kenny manages the Memphis Fortier branch office. He has been with Fortier since 1999. Prior to Fortier, he served as the Safety Director for the Association of General Contractors (AGC) of Tennessee and prior to his retirement from the US Navy, he was an Instructor at a U.S. Naval Training Center. Kenny became a Certified Safety and Health Officer (CSHO) for Construction & General Industry in 2004. Tony has been a Fortier Safety Consultant since 1995. Prior to Fortier, Tony held a Superintendent position with Powell Building Group and Turner Construction. Tony is an OSHA Authorized Construction Trainer through the U.S. Department of Labor and a Medic First Aid Instructor through the Health & Safety Institute. Clay has been a Fortier Safety Consultant since 2002. Prior to Fortier, Clay worked in the industrial and manufacturing environment for over 25 years. During this time, Clay was instrumental in the implementation and responsibilities of the company's workplace Health & Safety Programs. In addition to being an OSHA Authorized Construction Trainer and Medic First Aid Instructor, Clay also holds the "Train the Trainer" Certifications for Power Line and Managing Mobile Crane Hazards under the Construction Safety Council. Chris has been a Fortier Safety Consultant since 2002. Prior to Fortier, Chris conducted safety audits of jobsites for H+M Industrial Services. Chris is an OSHA Authorized Construction Trainer through the U.S. Department of Labor and a Medic First Aid Instructor through the Health & Safety Institute. James has been a Fortier Safety Consultant since 2010. Prior to Fortier, James was the Safety Coordinator for Granite Construction Company. James received a Bachelor of Science degree and Master of Science degree from Murray State University and is a Graduate Safety Professional (GSP). Tom Fortier has been a Fortier Safety Consultant since 2016. He graduated from Vanderbilt University with a Bachelor's Degree in 2011 and attained his MBA from Belmont University in 2014. Tom is a Certified Flagger Instructor and has completed several OSHA trainings including the 510 Course, Fall Protection, Electrical and Industrial Hygiene. Tom is a Medic First Aid Instructor and teaches numerous other courses for Fortier. Copyright 2016 Fortier Loss Control Consultants, Inc.